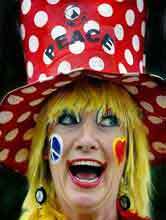 World Peace Clowns is an initiative inspired by my desire to give joy to people. I would like to thank Patricia Cameron-Hill, Dr. Shayne Yates and Dr. Patch Adams for encouraging me to become a clown. World Peace Clowns visit schools, workplaces, hospitals and perform spontaneously on the streets to create a positive atmosphere for people to feel connected with others. Giving service to the community. Clowning is spontaneous and non-judgemental and enables clowns to experience ‘peace’ in action. Special thanks for the photo of ‘Peacefull’ by Andrew Brownbill, Heidelberg Leader.